Accept, if you will, that an Earth depleted of its own resources eventually became dependent upon a giant energy beam being fired at it from the moon. No, just accept it. The beam becomes the planet’s new source of energy, and everyone’s happy, until the day it mysteriously switches off. Click. The lights go out. Earth is a bit stuffed, and the powers in charge, with neither charge nor power, abandon the whole project and resign humanity to a grim, electricity-free future. They believe they’ve no means of contacting the moon base, and no hope of fixing it. But not everyone is so pessimistic. A band of rebel scientists and techies are determined that something can be done, and working out of an abandoned base try for years to gain the means to send someone to the moon to find out what the blazes is going on. So after four years of dark Earth misery, they’re finally ready, and goodness me, it’s you who’s going! 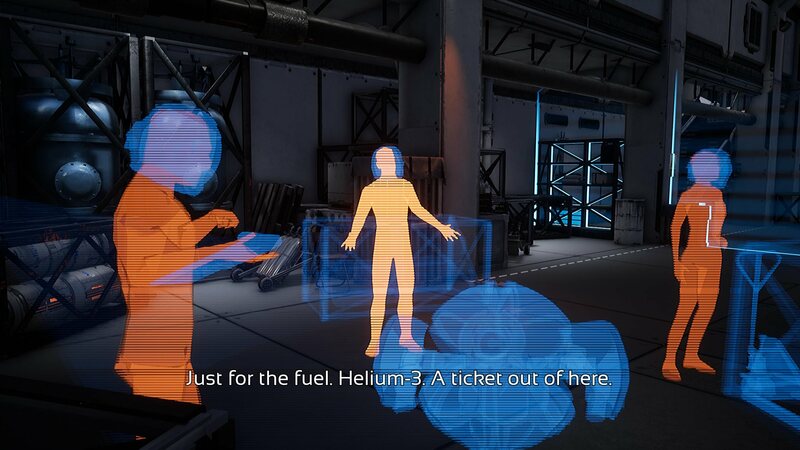 So begins a first and third-person narrative adventure that rather interestingly combines ideas familiar from successful walking sims like Tacoma with frequent action beats, and even a little bit of Ubisoft-style tower ascension. And it all comes together rather well, if a little clunkily in places. 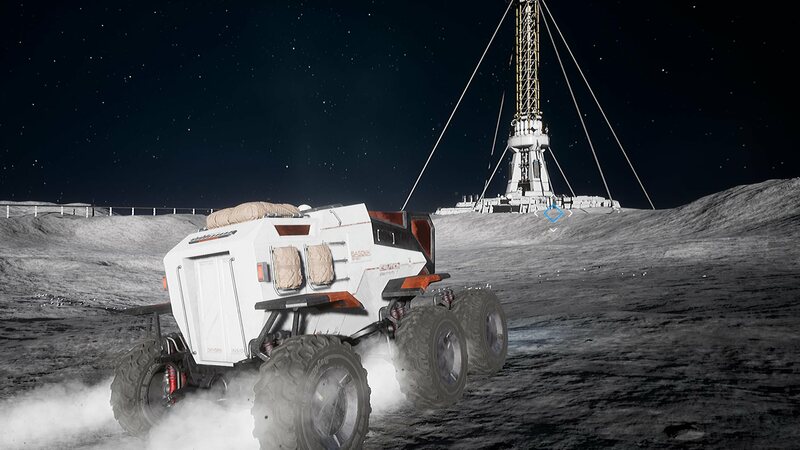 The core of the game, perhaps about five or six hours long, is spent exploring a few different areas of the quite extensive moon base constructed in the 2040s. 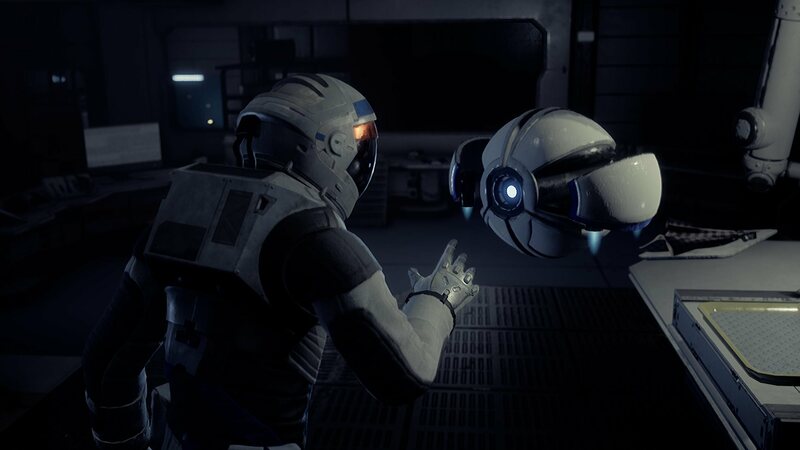 As you go, you discover all the parts in your way that aren’t working, and set about trying to fix them, whether by realigning satellites on the lunar surface, or finding access codes locked in crew quarters, or sending your floaty robot companion down space-vents to activate distant switches. En-route you’ll encounter all manner of story about what took place four years ago, through notes, emails, environmental storytelling, and perhaps most directly, audio and holographic video recordings. I’ll not touch on the nature of the story at all, because I had the pleasure of arriving on the moon with no prior idea of what happened, so you should too. Discovered elements of the story are stored in a log, and as you play you piece together the totality of the events leading up to the power failure on Earth. And rather effectively. Or so I thought, until the very final moment. I’ve re-watched it three times now, certain I must have missed some sort of twist, or failed to understand the consequences of a previous piece of information, or simply that I’d just not paid proper attention. It certainly still could be the case that I’m being a thicko and entirely failed to make a leap of comprehension, but even if so, I’d still argue that the game reaches nothing close to a conclusion of the story it had been telling. Once it was done I scoured its Steam page and website to see if it’s “episode 1” of an ongoing series, and can find no such information. What I have found is that the developers split with their publisher Starbreeze only last month, announced in the same post that revealed the release date. Certainly unusual, but suggestive of nothing in particular. Which leaves me very stuck. Because this is really good! Right up until it stops midway through the story it was telling. 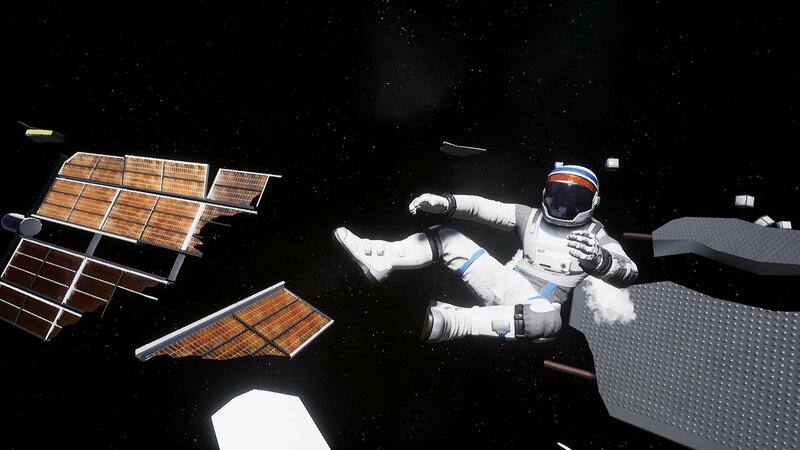 It does such a good job of delivering heart-racing moments, desperate attempts to reach oxygen supplies before time runs out so compelling that I found myself leaning ever closer to the monitor in the unconscious hope that it would somehow get me there faster. It also manages the slow moments well too, making calm exploration the larger focus, with plenty of hidden details that flesh out the story. And it has a splendid score, a lot of detail, and some excellent surprises. There is, it’s worth noting, some absolutely shocking expositional writing. “This building has been our home for years now. I can’t believe you’ve be leaving us soon,” says a recording found inside the Earth-base in which you begin. Um, thanks – I’m guessing my character probably already knew where they lived? Let alone that the game had already explained how our crew had been based here during its lengthy info-dump exposition opening! Beyond this, the writing is mostly fine, although without any moments of real flair. Voice acting varies, some great, some a bit like they let their brother have a go. There are also some issues with textures. Sometimes the details are really fantastic, other times you’ll pick up an object that’s a blurry mess, the writing nearly illegible. And I did once have a moment where my character fell through the wall, briefly appeared outside the base on the moon (eek! ), and then pinged back inside with his torso wedged in the floor. Only once, but it meant restarting from the last checkpoint. a) John is being a giant idiot and entirely missed the point, and you might do the same? b) It stops midway through its own story in the most incredibly unsatisfying way. Which brings us back to that age-old discussion about endings. If you have a great time reading a book, but the last page abruptly fails to conclude any of the elements you cared about, does all that previous pleasurable time spent reading still have validity? I’d argue that yes, it does. And with time, the annoyance of the ending (or lack there of) begins to fade, and the journey feels more important. Then again, if you went out to a restaurant and enjoyed a delicious four-course meal, but then the dessert gave you food poisoning, you’d probably not recommend the place to friends. So I’ll leave that with you. 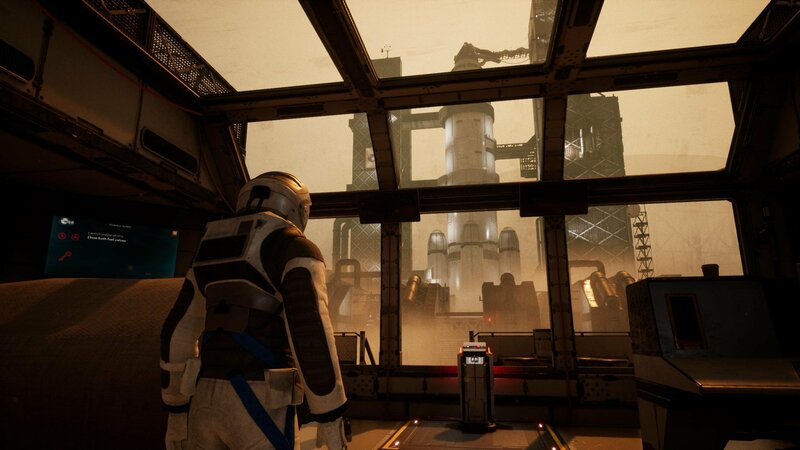 Tagged with feature, KeokeN Interactive, review, wot i think, Deliver Us The Moon: Fortuna.